National Croissant Day! Oui, Oui! Croissant means “crescent” in French; referring to its shape. 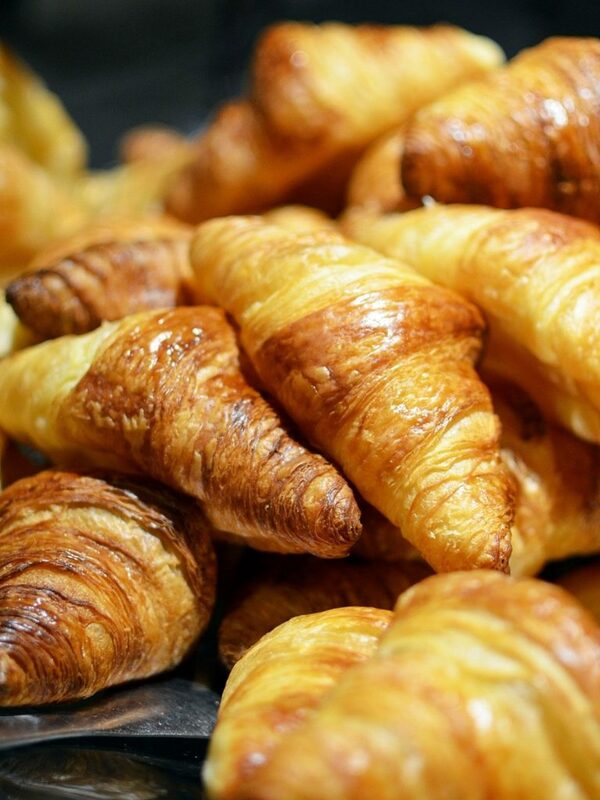 It is believed that the croissant actually originated in Austria, sometime in the 13th Century. The main ingredient of puff pastry is butter – it gives it the delicious flavour and flakiness. Croissants can be filled with numerous foods, such as, chocolate, ham and cheese, nuts, dried fruits. Check out our Croissant Recipe – so buttery and delicious! Using the standmixer with the dough hook attachment, mix the flour, salt, sugar, yeast, and 58g of butter at a slow speed. Pour the milk gradually as the mixer is mixing on low. When all the milk has been poured, increase speed to medium. It is done mixing once the dough no longer clings to the side of the bowl. Shape the dough into a ball and wrap in plastic wrap. Refrigerate for at least 2 hours. On a sheet of parchment paper, roll out 340g of butter into a square (20cm by 20cm). Refrigerate until you are ready to laminate. Roll the dough out to a square (25cm by 25cm). Rotate the dough so that it is a diamond. Place the square of butter into the diamond. Fold the dough corners into the middle . 6. Roll the dough into a rectangle (60cm by 20cm). Fold the dough like a book. 7. Refrigerate for 30 minutes. 8. Roll the dough into a rectangle (50cm by 20cm). Refrigerate for 30 minutes. Feel free to leave overnight. Roll the dough into a rectangle (75cm by 20cm). Cut into triangles. Roll the dough into a rectangle (75cm by 20cm). Put chocolat on one edge and roll the dough into a log. Cut into smaller pieces. 2. Brush with egg wash and proof for 2 hours. 3. Egg wash one more time and bake at 375F for 10 minutes. Rotate croissants, then bake for 8 more minutes.